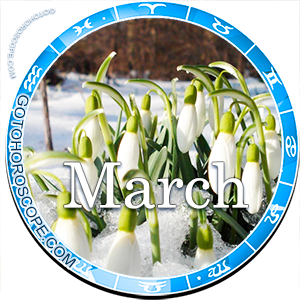 March 2011 Horoscope Libra, free Monthly Horoscope for March 2011 and Libra Astrology Forecast for the month ahead. 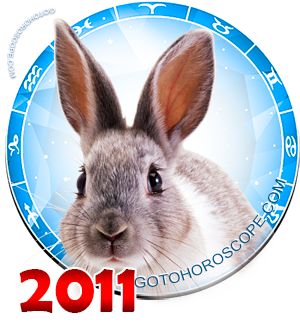 The exciting mood of March 2011 year of the White Metal Rabbit will be to the liking of the poetic soul of Libra. The first days of spring will exacerbate Libra's desire for change, and they are most likely will decide on what to learn or change their place of work. Such a tactic would be justified if the former place of work does not bring the desired material and moral satisfaction, and Libra feels able to do more than what is offered him by his bosses. It is not worth looking for job in March because this period is unfavorable for it. Before searching for a new job, Libra needs to gain experience, moral energy for change, develop special fighting spirit for a better life, work with zest to charge himself with energy before the forthcoming changes. 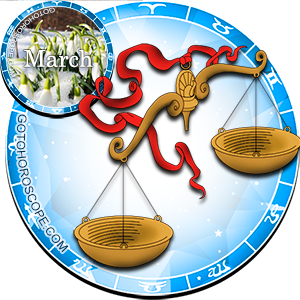 First, in the beginning of March, Libra needs to revise his past mistakes and resolve those problems in life that dragged on from the past. He needs to get rid of heavy load of memories about failures because doing so will help him gain optimism. A rigorous analysis of past activities, identification of successes and failures will help find their causes and avoid them in future work. Unlike other Zodiac signs, Libra does not need to restrain the rhythm of business affairs, which has been constantly growing from the first decade of March. However, it is also unnecessary to run ahead of time, remembering that prudent management of business affairs and their timely correction can give a significantly better result than a significant speeding up of events. It will be useful for representatives of this zodiacal constellation to visit the required classes, read professional literature to enrich their knowledge - which, incidentally, may very much be useful at a new place of work in the future and become a key to higher salary. Libra's financial sector is stable in March but almost has no tendency to increase, and therefore to safeguard his money, he should invest in real estate or in other valuables. To save money, Libra should acquire something tangible, and not to trust various securities that may lead to large losses of money. When conducting such transactions, as well as all other financial affairs in March 2011, Libra needs to think through every detail, check all the documents they prepare and sign. You can consult with close friends in financial matters so as not to be left alone with problems. From mid-March, Libra should pay great attention to his own health as a guarantee of success and business victory, because without good health, Libra will not be able to achieve any peaks in life and in business sphere. By the way, his own health is a great way to attract investment - he can properly cook his food, go for a massage, visit the gym, swimming pool, take multivitamins. If a business deal offered to Libra does not inspire confidence, he should listen to his intuition and reject such deals for now before they causes him irreparable harm. March 2011 year of the White Metal Rabbit can be called a new period in personal relationships, when a passion for change will make Libras think on radically changing their lives. The planetary union warns representatives of this zodiacal constellation that radical and hasty changes can harm, and does not recommend making important decisions relating to marriage proposal, marriage, divorce, etc. before the end of March. One should not avoid meeting new people and - perhaps, one of such meeting will be a landmark and turn into a beautiful and passionate romance. Married Libras may have misunderstandings and conflicts with their close ones because all their energy is focused on their job. There is no need of dragging the matter into conflict - it makes sense to figure out the problems calmly and try to mutually solve them. Libra should not rely on gossips, he must believe in his own intuition, which has never failed him.